Robert Croft has dismissed suggestions that he could still be registered as a player for Glamorgan next season. The veteran spinner took 5-31 in his last game against Kent and is set to retire after the final Division Two game of the season in Cardiff. Croft will join the Welsh county's coaching staff next season and is determined not to stand in the way of young off-spinner Andrew Salter. "I think that needs to be put to bed," said Croft. "And when an off-spinner needs to play, it will be the young lad who gets the nod." Croft will end an uninterrupted 23-year playing career with Glamorgan after the game against Kent. 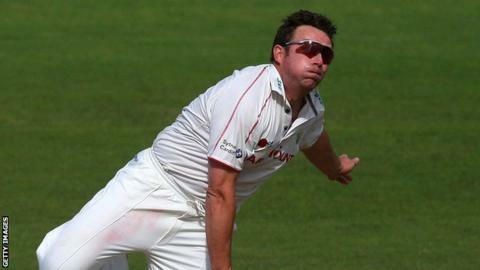 The 42-year-old, who played in only 12 games during this season, took his total of first-class wickets to Glamorgan to 1173 since making his debut in 1989. Croft passed the 1,000 wickets mark in 2010, becoming only the fourth Glamorgan player to reach that milestone and the first since Don Shepherd in 1960. Swansea-born Croft has already passed 10,000 runs for the county, making him the only Glamorgan player to achieve the double of 1,000 first-class wickets and 10,000 first-class runs. Only eight other players have accomplished such a feat for any county since 1945. He claims the prospect of combining a coaching and playing role for Glamorgan is not an option for him. "It's all in or all out," said Croft. "The opportunity has come to help coach and to assist the develop the next group of players coming through. There is a good young off-spinner prospect coming through in Andrew Salter. "I cannot concentrate on both. It is a difficult thing and while I am in the wings registered there will always be a temptation to call me back in." Croft has played a key role in giving Glamorgan a realistic chance of victory at the Swalec Stadium. Kent face a battle to keep their promotion hopes alive after they had to follow on in their County Championship Division Two match against Glamorgan at Cardiff. Glamorgan resumed on 334-8 on day two and added 56 runs to reach 390, with Jim Allenby ending on on 125 not out. Kent, who need to win to have any chance of promotion to Division One, fell from 137-2 to 170 all out. Croft is confident that Glamorgan, who have endured a disappointing season, can secure victory and give him the perfect send-off. "It has gone well so far," said Croft. "I have picked up wickets, bowled nicely and done a job for the team. We are in a good position in the game. "Kent are not the type of side to roll over, they have too much to play for for that. Hopefully, the ascendency we have got now has put us in a good position to finish the game off."